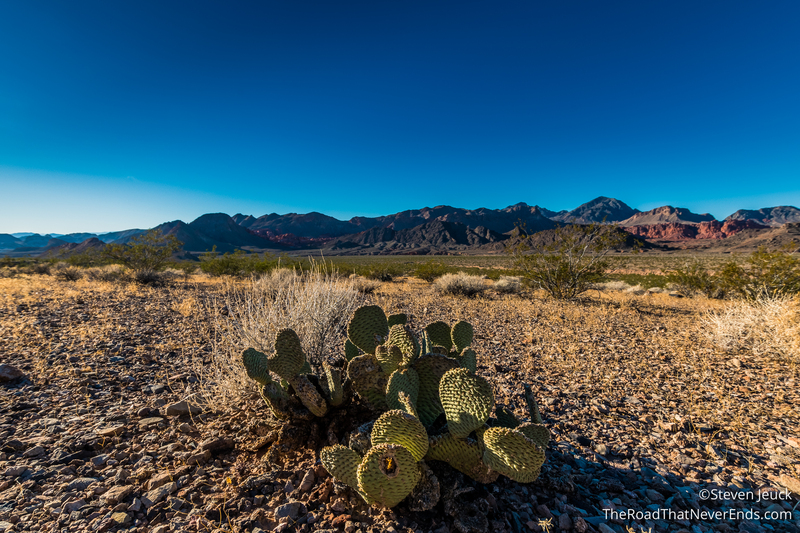 Just outside Las Vegas is Lake Mead National Recreation Area. 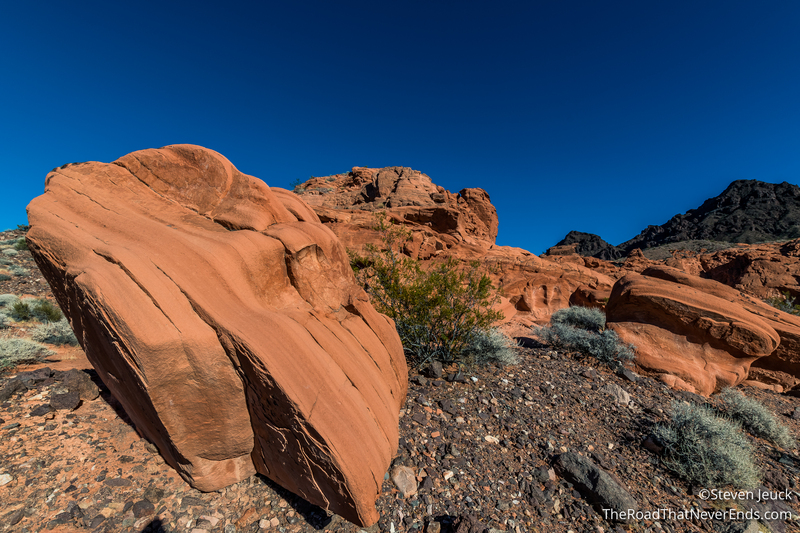 It is actually the FIRST National Recreation Area, designated in 1964. 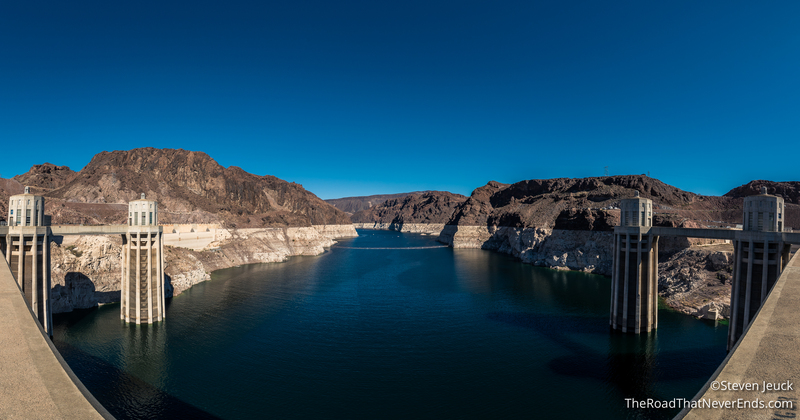 The area is famous for the Hoover Dam, but besides that there is plenty to see and do. Exploring by boat is not the only method to have fun here; hiking, swimming and driving are great ways to see wild life and the beauty of the lake! During our stay we were also able to catch up with two friends of mine that I haven’t seen in a few years: Jen & Denise! I was so happy to see them and hike with them! We camped at a FREE dispersed campground called Boxtrail. We were camped on hard sand with a few neighbors and just feet from the shoreline. Sparky LOVED playing in the water, but with his short attention span would check out the neighbors to see what kind of food they had. He quickly lost his off-leash privileges. During our stay at camp we saw Egrets (which Sparky chased away), Roadrunners and even a Coyote. 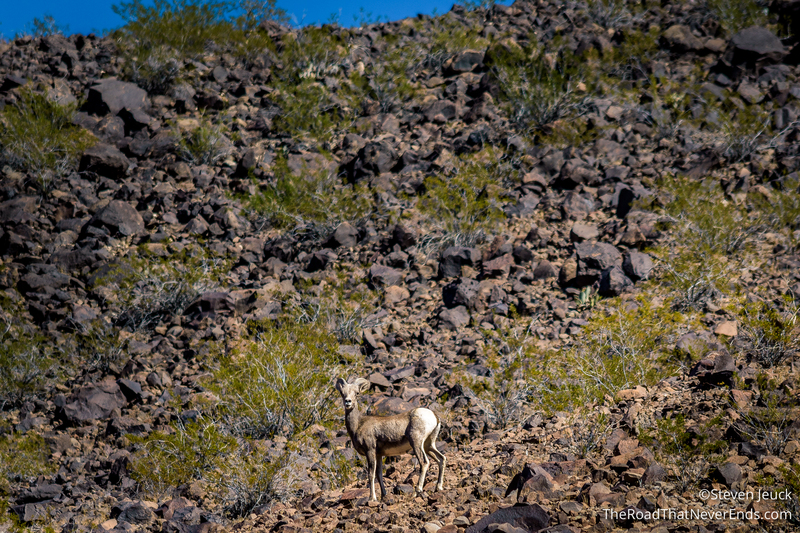 During one of our drives from camp we even saw to my delight Desert Big Horn Sheep! There are few negatives to the campsite. I do believe one of our neighbors was living there long-term. Their travel trailer looked like it hadn’t moved in ages. ON the Saturday and Sunday nights we were there, there were lots of people doing bonfires by the beach. That doesn’t bother us, but when people leave tons of glass and trash – that bothers us. Other than that, we enjoyed the campsite a lot and would return again. Our first day there we met with Denise and Jen did the 8 mile Railroad hike. The hike leaves from the Visitor Center towards Hoover Dam. 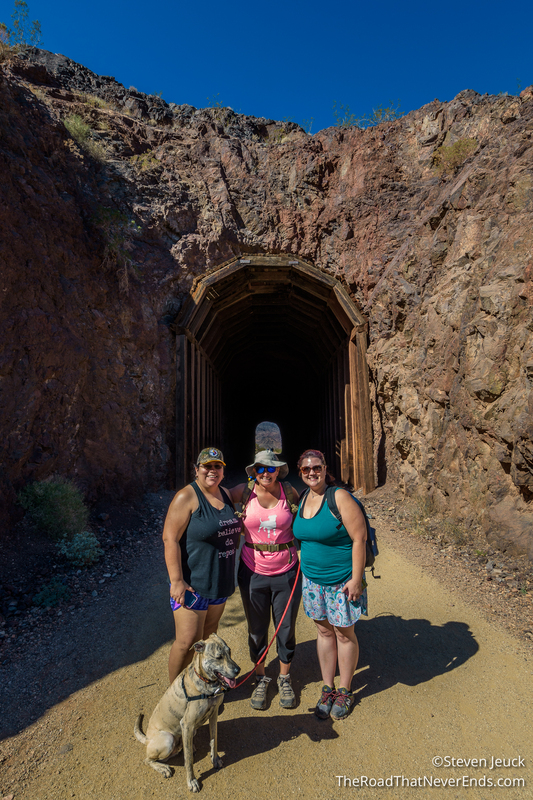 The trail follows the route trains took to haul supplies to Hoover Dam and included some amazing tunnels. In the desert heat, inside those tunnels felt GREAT. The trail was flat, and even though it was warm it wasn’t terrible. We didn’t see any wildlife on the trail, but did do a lot of people watching which can be just as fun. Most of the time on the trail was spent catching up with Jen & Denise. 4 miles into the hike we made it to Hoover Dam. The area was PACKED with people, and doesn’t allow dogs. Us ladies and Sparky sat in the shade while Steve checked out the dam. 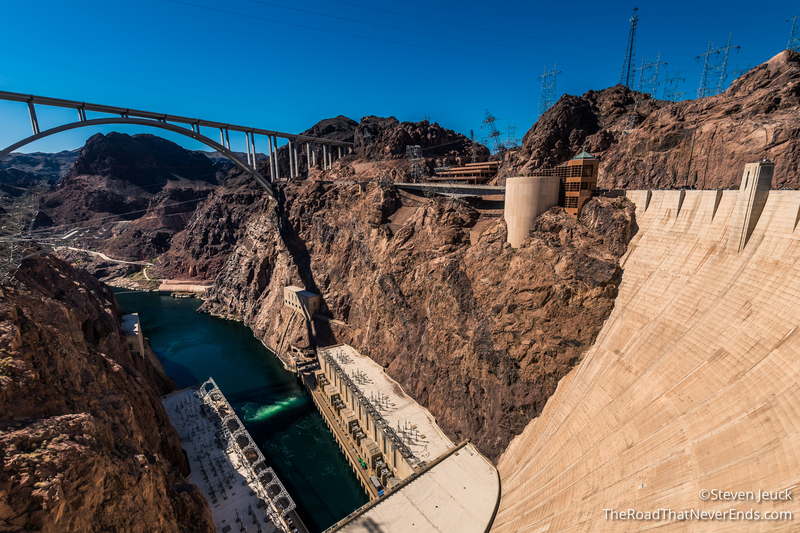 I have been to Hoover Dam before and was still blown away at the size of it. After our short little break we headed back to the visitor center. We weren’t able to find any shade picnic tables to we ended up having a picnic in the car with Denise & Jen (and the A/C!). It was a lot of fun. Sparky passed out quickly once he felt the A/C on him. Jen & Denise – thanks for spending time with us! We had so much fun and it was GREAT catching up with you. I hope to be watching a Knights game this spring and really hope we can see each other then. 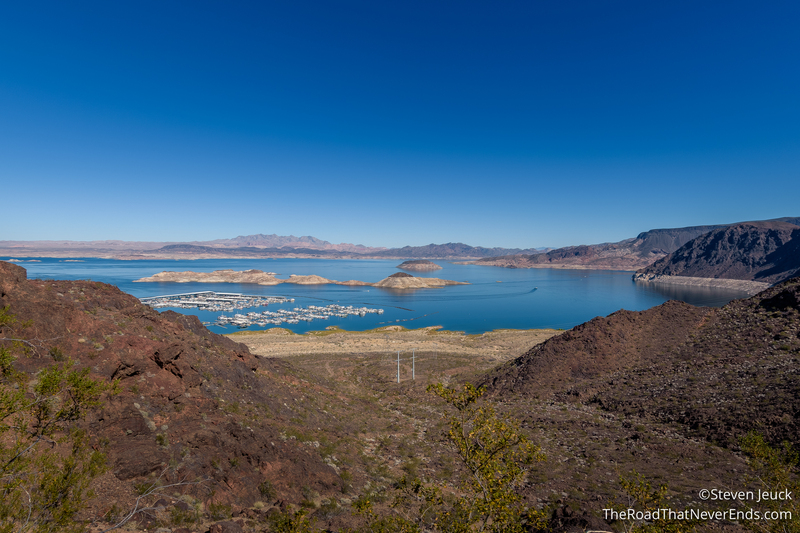 Perhaps we should do another hike at Lake Mead? The next morning we slept in and found ourselves taking advantage of LTE. We caught up on things we needed to do – e-mails, bills, planning a shower (me), and figuring out our next plans. We let Sparky run around in the water and even enjoyed some sunbathing too. We did an early afternoon hike at Redstones. The mile hike was a bit disorganized. There was no trail, or any guides to follow the loop. We ended up guessing where the trail was. We enjoyed it nonetheless. Overall, Lake Mead is much larger than I had anticipated. We barely scratched the surface of it. When I return, there is a trail that goes into the Colorado River that I look forward to doing (dogs are not allowed). Most trails are closed during the summer months because of the heat, so when returning I would go in the winter months.